You can do this with Adobe Acrobat 7.0 Standard —and spend $299 for the privilege—but there are less-expensive alternatives. If you’re the do-it-yourself type, you can accomplish this with Automator. If you’d prefer a ready-made solution with more options, pick up a copy of Monkeybread Software’s free Combine PDFs 2.1. Just launch the utility and plop the PDF files you’d like to combine onto its main window. You can drag the documents up or down the list to position them in the resulting file. When you’re done, click on Merge PDFs. Note that if you mix landscape- and portrait-oriented PDFs, you’re asking for trouble—when you print, parts of the PDFs will be cut off. If possible, reformat your files so they all print the same way. In recent versions of Apple’s iTunes, control-click on a track and, from the contextual menu that appears, select Show In Playlist. The resulting submenu will list all the playlists that include that track. You can use a smart playlist to help you locate songs that appear in multiple playlists. 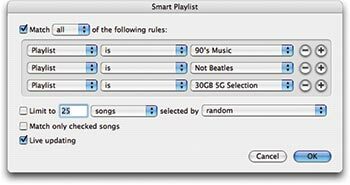 For example, create a smart playlist (File: New Smart Playlist), set it to Match All The Following Conditions, and then add these conditions: Playlist Is 90’s Music, Playlist Is Not Beatles, Playlist Is 30GB 5G Selection. The resulting playlist would display only tracks found in all three of those playlists (see “Sort Smarter”). Sort Smarter A smart playlist such as this can find tracks that appear in multiple playlists. If you want to take a sterner approach toward duplicates, choose Edit: Show Duplicate Songs. In the list that appears, you can then weed through the tracks and remove any you deem unnecessary. Note that some aren’t really duplicates—one track may be a live recording of a particular tune, while another may be the studio version. Take a gander at the Album column to see if it’s actually a different track. Another option is Doug Adams and Charlie Strauss’s Corral iTunes Dupes 1.0 (free). It’s able tell the difference between a studio and a live track, among other things, and tosses duplicates into a Dupes playlist for you to sort through. Press and hold the F12 key. Let’s start by locating your files. By default, iPhoto 6 (part of Apple’s iLife ’06, $79) stores your pictures here: your user folder /Pictures/iPhoto Library/Originals/ year / roll number . The year is the year you imported the photos, and the roll number is the number iPhoto assigned to the roll—Roll 143, for example. If you’ve edited any images, you’ll find the edited versions in your user folder /Pictures/ iPhoto Library/Modified/ year / roll number . However, with iPhoto 6, pictures need not be stored this way. Go to iPhoto: Preferences and click on Advanced. Here you can choose to disable the Copy Files To iPhoto Library Folder When Adding To Library option. Do so, and your pictures will stay where they are, in the structure you’ve created. In previous versions of iPhoto, you’ll find your pictures by following this path: your user folder / Pictures/iPhoto Library/ year / month / day, where year / month / day would be something along the lines of 2006/05/28 (representing pictures created on May 28, 2006), for example. If you’ve edited any images created that day, you’ll find the edited versions in the date folder and the original images in a folder called Originals. Now that you know where the files are, let’s look at those that may be corrupt. If luck is on your side, the corrupt image is one you’ve edited. In such a case, you can select the corrupt image in iPhoto and choose Photos: Revert To Original. If iPhoto fails, you can try re-importing the original image from the folder that houses it. But before tossing images that won’t behave, I attempt to open them in a different application. For example, some JPEG files I work with refuse to open in Apple’s Preview but will open in Adobe Photoshop. If you can successfully open the image in another application, put the Save As command to good use and create a fresh copy. Even if the image won’t open for love or money, you’re not completely out of luck. You still have a tiny copy of it—the thumbnail. In iPhoto 6 you can find it here: your user folder /Pictures/iPhoto Library/Data/ year / roll number . In earlier versions of iPhoto, thumbnails are in the date folder’s Thumbs folder. This picture is small consolation, I know, but in cases where you’ve lost a shot that you treasure, it may be better than nothing. Still not satisfied? If you’re a pack rat who doesn’t take a lot of pictures, check your media cards to see whether you left a copy of the image there. Or if you’ve got a video iPod, perhaps you’ve stored a copy on it. Count yourself blessed if you’ve enabled the Include Full-Resolution Photos option in the Photos portion of the iPod preference pane. Juicy Photos File Juicer can extract your precious (albeit low-resolution) photos from a color iPod. If you have, just rummage around in the iPod’s Photos folder to find your image. If you haven’t enabled this option, you can use Echo One Software’s File Juicer ($9) to extract lower-resolution images from a color iPod (see “Juicy Photos”). Choose Format: Fonts: Show Fonts. In the resulting Font palette, click on the fourth icon from the left at the top of the window (the one with the small page icon). This pops up the Colors palette, where you can then choose a new background color (see “A More Colorful Palette”). 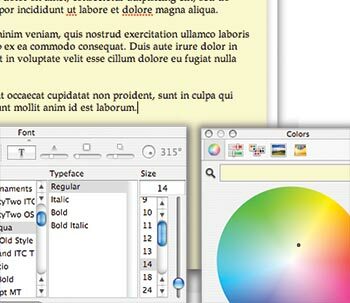 A More Colorful Palette The Font palette is the key to colorful backgrounds in TextEdit documents. When you start up the Mac, hold down (and keep holding down) the option key. When you do, a mauve Startup Manager screen appears, displaying icons of all the bootable volumes attached to your Mac. Your FireWire drive will be one of them (assuming, of course, that you’ve installed OS X on that drive). The trick to doing this is using a smart album. To begin, find some way to identify the pictures you want to archive and then delete from your library. If you’d like to archive older pictures, this is a cinch. Just select File: New Smart Album, and configure the resulting sheet to read Date Is Before X, where X is the date you’ve determined as the dividing line between the photos you want to keep on your Mac and the ones you want to archive. iPhoto will create a smart album that contains the photos you’ll archive. To assign keywords to a batch of photos, select those photos, click on the Keyword icon (the small key icon) at the bottom left of the iPhoto window, and drag the photos to the keyword you wish to assign. If there’s no appropriate keyword there, make one of your own by choosing iPhoto: Preferences, clicking on the Keywords tab in the resulting window, clicking on the plus sign (+), and then typing a keyword. Now create a smart album based on that keyword or rating. With the photos in the smart album, select that album and choose Share: Burn (called Burn Disc in versions of iPhoto prior to version 6). You’ll be prompted for a blank disc. Click on Burn when you’re ready to go, and iPhoto will burn your photos to the blank disc or discs. If these photos are precious to you, I’d suggest backing them up more than once—and to media other than CD-R or DVD-R. The Export command in the Share menu allows you to save your files to a hard drive. I don’t believe CD-R and DVD-R are the “forever” media some claim. With your photos safely archived, you can now delete them from your iPhoto library. To do so, select all the photos in your smart folder and choose Photos: Move To Trash. Your photos will be placed in iPhoto’s Trash. To delete them from your drive (and you’re really, really sure that you’ve backed them up properly, yes? ), control-click on iPhoto’s Trash entry in the Source list and choose Empty Trash.